Should I take a cellphone on tour, even if I don’t plan to use it to make calls while in Europe? Yes. Even if you don’t plan to make calls or texts while abroad, you will want it at the airport before we leave, and to call home after we arrive back in the US. If you have a smartphone, you will be able to use the WiFi features (email, messaging, etc.) when there is WiFi service. Apps like WhatsApp and Viber are excellent ways to communicate with people back home. These will also work if you have a data plan, but be very careful – some data plans are VERY EXPENSIVE! You can also use it as your camera, but make sure you have enough memory, as you will be taking many, many pictures. If that is your plan, be sure to transfer all the photos currently on your phone to a computer or a hard drive, and then delete them from your phone so that you have enough memory to store your new photos. IMPORTANT: Using a cell phone in Europe can be EXPENSIVE and distracting. You are spending a lot of money to visit and see new things. It would be a shame to miss seeing the alps or not to meet new friends on the bus because you were playing a game on your phone for the entire tour. Use it sparingly (unless you are taking pictures). Enjoy every moment of the trip! What do I need to know about international mobile phone use? If you are planning to use your phone to make regular phone calls, you need to make sure your phone will work in Europe. It will need to have multi-band GSM capabilities. ATT and T-Mobile operate with a GSM signal, Verizon and Sprint do not. However, some smartphones (iPhones, for example) have built-in GSM capabilities. The easiest way to find out is to ask your mobile phone provider if your phone will work in Europe. If it will not, see the last paragraph below. You will need an international roaming plan. There are several ways to do this. The easiest way is to get a plan through your mobile phone service provider. T-Mobile ONE and Sprint’s “Global Roaming” add-on are free and include Unlimited International texts and data. Phone calls to and from the US are 20¢/ minute. AT&& has the AT&T Passport and Verizon’s “Monthly International Plan” are $40 for 30 days with differing amounts of call time, text and data. Get a Global SIM card. You put this in your phone after you leave the US. It gives you a new phone number from another country, and sometimes a “toll-free” US number as well. (That means anyone from the US can call you for free, but you pay for the incoming call). Mr. Fink has used the International SIM card from Telestial.com for a number of years and it has been very cost effective. (With the International plan, incoming calls and texts are free, and there is no connection charge for outgoing calls or texts.) There are other plans offered by Telestial, and there are many other companies that offer international roaming plans like goSIM and World SIM. Read the fine print carefully, as there are often connection and other charges. Also beware of companies like OneSimCard that give you an Estonian number – the rates for using your phone in Europe will be very cheap, but anyone calling you will be making a very, very expensive call or text. Search on the internet for “global sim card.” Also, make sure it will work in all the countries we are visiting. Some providers are very inexpensive in one country, (e.g. Lebara in France), but expensive if you use it outside of that country. VERY IMPORTANT – most of the plans allow you to use data (for using GPS, surfing the net, checking Facebook…) but using data can be VERY EXPENSIVE!!! (There are many stories of people running up bills of several THOUSAND dollars in data cost!) Some plans charge $20/MB – which could set you back $40 just for checking you email and downloading a picture! Always read the fine print about rates. It’s probably best to turn cellular data OFF while on tour. In order to use an international SIM card, you will need to have your phone “unlocked”. Ask your mobile phone carrier to do this for you. If your phone cannot be used internationally, most of the SIM card providers will also sell you an unlocked international phone with the SIM card at very low prices. Will my cellphone work in Europe? Your American cell phone won’t work in Europe as a phone unless you have a GSM phone (with a global chip/system installed) and an international roaming plan. You must contact your wireless service provider and give them a specific description of where you’re going (list the countries) and what you want to do with the phone (calling to the U.S.; texting; internet). Also, it’s important to ask them up-front about the “plan” so you’ll know the exact costs of each service, without confusion. For more info about international plans, click here. What Apps will be useful while traveling? Remind – we will use Remind while on tour to let you know about any itinerary changes or other important information. Google Maps and CityMaps2Go for Maps and directions. Be sure to use the download to phone feature for use when you don’t have wifi or data. Hotel apps -if you have signed up for a frequent traveler account, you may be eligible for some perks like free or faster wifi. Can students purchase calling cards over in Europe or should I do it here? Alert: the calling cards you’ll find here on our shelves – even those declaring that they’re “international” – are almost all lacking in convenience when it comes to making calls from Europe back to the states. Many advertise a specific number of minutes, but calling from there to here (accessing the #11 country code) chews up minutes before you can even speak! A “100-minute” card purchased here sometimes might give you only a third of that! Some of our staff members strongly recommend www.pennytalk.com. Others have purchased “MCI International” cards at BJ’s Wholesale Club (if you can find one of those); for one of our Staff members, this single card worked very well for three years in a row. Solid advice, however, is to simply get a calling card when we arrive in Europe. There are many, many shops in most of the places we’ll visit, and calling cards are quick and easy to get. Those will work more conveniently for calling from Europe back to the states. Calling TO Europe: the Itinerary you’ll receive at check-in will list all of the hotels & their phone numbers (reminder ~ please don’t try to pre-arrange calls on specific dates & times; that almost never works, and can lead to frustration). Call your phone company and ask about an international calling plan. It is usually under $20/month – you can usually set it up just for the time your child is on tour, and it can literally save you several hundred dollars! By the way, e-mail has become a great way to communicate: more than half of the places we’ll visit have internet cafes, and students can pay (it’s not expensive) for a half-hour, or hour, of computer time. Note: the keyboards are NOT all set up in the typical “QWERTY” orientation! Be prepared for some very slow hunt-and-peck! Some hotels have on-site computers which you can use (for free or for a small fee) for internet & e-mail. Also, most places we visit have internet cafes with inexpensive computer or Wi-Fi access. Wi-Fi is available at many locations (sometimes free or for a fee) for those of you who have an iPod Touch, tablets, netbooks, web-enabled smart-phones, etc. Starbucks has free Wi-Fi in Europe. Be aware, however, that at many hotels, the Wi-Fi is slow, and with 100 AMA students trying to Skype at the same time, internet access is often very slow or intermittent. Some people have carried full-size laptops, but it’s a definite risk and adds weight! Do you really want to be lugging it up to the top of the long, steep hill to the fortress? What if you drop it in a canal? What if you leave it behind at a Cafe? NOT RECOMMENDED! If you do choose to take a laptop or tablet, be sure you check carefully about the cost of Data Plans – they can be VERY EXPENSIVE – some charge $20/MB – which could cost you $40 just to check your email or download a photo! We had a question about mail. Will students be able to receive mail at the hotels they are staying at, and would it reach them? Yes, they can receive mail at the hotels (but read on!). The amount of time it takes for mail to get from the U.S. to any given hotel is extremely variable so you will need send letters 10 or more days in advance! The best way – by far – is to use a FAX. When you arrive at the college, the final printed Itinerary will give the fax numbers for every tour-stop. If you send a fax, it will be delivered by the hotel staff to Mr. Fink or one of the other directors. In some towns, the Red Tour might be divided into several small hotels. At least one of the Directors will be in the hotel with the fax machine. The faxes received at each hotel are handed out to students at breakfast and dinner. It’s a really nice treat, actually, and every year students get pretty excited about getting a note from home. Some people send a handwritten letter, while others get a little more extravagant with drawings, puzzles, or a photocopied hometown newspaper article. Anything from home is nice! IMPORTANT – Whether it is a letter or a fax, ALWAYS put “AMA RED TOUR” and your child’s name clearly on the first page of the fax or envelope. How do I get up-to-date information on the tour progress? Mr. Fink will post to Facebook on a regular basis throughout the tour. Click on the Facebook icon to the right to visit the page. When on the page, click the like button to “Like” the page. Click the dropdown arrow on the like button and then click on “Get Notifications”. If you have selected to “Get Notifications” when you login into Facebook, all the posts for the tour will be easily available. 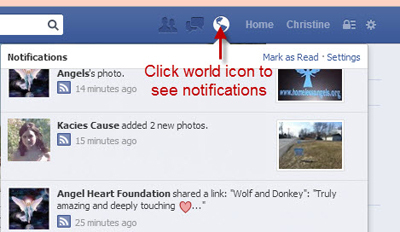 Click on the world icon to see your notifications. Facebook posts are automatically tweeted to Twitter. Click on the Twitter icon on the right and follow the tour on Twitter.